Nolan model CCS-2 cushioned car stops transfer impact force directly to the cushioning tie and ballast. The CCS-2 uses the rail car’s weight for additional braking friction on the rail. CCS-2‘s are attached to the rail using four bolts (per pair). No holes to drill. The CCS-2 is universal fit, and all-welded steel construction. 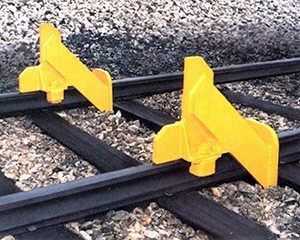 CCS-2 Car Stops are designed for EXPOSED RAIL TRACK. If you have flush rail (rails encased in pavement), contact Nolan before ordering. IMPORTANT NOTE: CCS-2 Car Stops are sold per unit, but must be used in pairs (2 CCS-2‘s).